I've tried to use *_OVERFLOW_CHECK == 0 and simulate the slowdown it causes by sys_msleep(1). It does help, i.e. program behaves like when *_OVERFLOW_CHECK == 2, sends 200k packets without hang. The sleep is placed after the sending of each ping packet (how they are being send is described below). Can sending 254 packets through RAW socket in a loop – without sys_msleep(), i.e. tight, fast – cause problems? One person suggested to me that I might starve TCPIP thread, also by problematic thread priorities (didn't check that yet). etc. Basically, ETHARP sees that it sends ARP request (because "xmit: ..." increases), and it really does send it, but the response to the request is ignored – "recv: 2" doesn't increase. A basic conclusion that can be done: the gateway at some point disappears from ARPTABLE and this triggers second ARP request to reestablish it in this cache. Constant "recv: 2" suggests that ARPTABLE isn't fixed, gateway isn't placed there again, so no ping packets are being send, only repeating ARP requests. get_ip4_addr_4 returns fourth number from IP address. 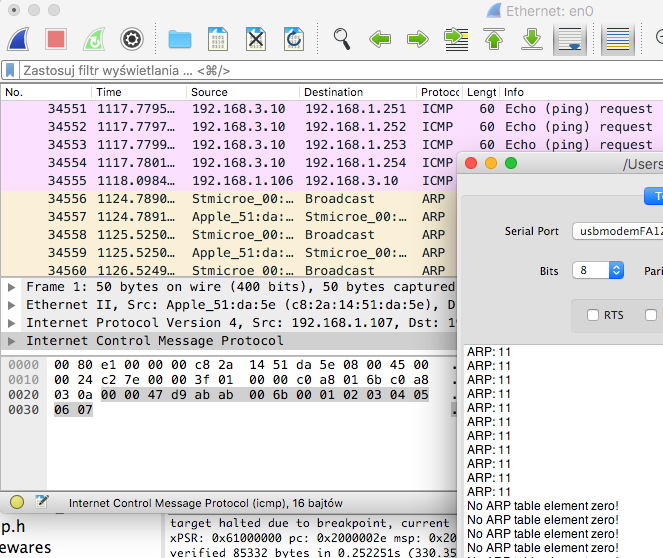 I attach 2 screenshots, 1st when everything is OK, "ARP: 11" is printed (gateway is at 192.168.3.11), ping packets are being send. 2nd one when the gateway suddenly disappears from ARPTABLE, immediatelly causing ping packets to not being send. Do I starve TCPIP thread? Should this starving result in disappearing of gateway from ARPTABLE? Why subsequent ARP requests don't reestablish the gateway in ARPTABLE?